Hey guys, Roger's singles campaign got underway today after he crashed out of the doubles on Monday with Haas and he started with a comfortable 6-3 6-3 against German Cedrik-Marcel Stebe. It wasn't exactly a vintage performance from Roger but he got the job done and despite dropping serve in the first set when serving it out there weren't too many other concerns other than a number of, I want to say uncharacteristic, but probably not the case just recently, unforced errors. Other than that Stebe posed little threat, he was an ok ball striker but had no real weapons or the game to hurt Roger with. 3 & 3 is a comprehensive win and for his first match on grass perfectly acceptable. I actually missed the first couple of games of the match but it's fair to say it was a relatively good start from Roger as he got the early break which is nice and at 5-2 up a double break he looked to be cruising before somehow managing to drop serve when serving out the set with some really poor play. He has a habit of doing this lately against very weak opposition and it's not really a great sign when you're struggling to close out a set when the guy you're facing lacks any sort of ability to trouble you. Fortunately Roger had the double break and Stebe failed to hold serve anyway handing Roger the set tamely after recovering one of the breaks. Once Roger had the set in the bag you knew the match was over, there was just no way this guy was going to be able to turn around that deficit and I expected Roger to play quite freely in the second set. That didn't really happen though and the second set was poor from both guys, I lost count of the amount of times Fed shanked a backhand or forehand or just played the wrong shot which made it boring to watch. Stebe was equally poor making a lot of errors so it was never really going to cost Roger anything as he wasn't made to pay for any mistakes. This time around 1 break of serve proved to be enough, and although the game at 5-3 was scrappy from Roger he did get the job done eventually after missing some easy balls to seal it 6-3 6-3. Considering this was Roger's first singles match on grass I thought it was comfortable. There's not really much to talk about and the positive is the fact he won the match in straights, can't really ask for more at this stage. He didn't look too enamored with his own performance however and looked like he wasn't pleased with the way he was hitting the ball, I can understand that and I probably attribute it to movement. Shanks and mistiming usually stem from poor footwork and it's probably going to take some adjustment for him to get right into the groove after a couple of months on clay which is obviously much different. The only disappointing aspect from my end is failing to serve out the first set, it might just be me thinking it but it is becoming a habit, pretty sure it happened at the French a couple of times and even though right now he's getting away with it, it is the sort of thing that can cost you at some point just like when he was 4-2 up against Clownga at the French. I guess because it's the first match on grass I'll cut him some slack, he won in straights afterall and didn't have to do a whole lot to progress so overall it's a good start to the tournament. Next up for Roger in the Quarter Finals on Friday is another German, Mischa Zverev, who defeated Mirza Basic; the man responsible for eliminating Jerzy Janowicz in the 1st round. Roger has played this guy once before in Rome back in 2009 and won in straights. One of the sets was a breaker so it must have been quite tight but I can't see this guy really causing too many problems. He's ranked at a lowly 156 and hasn't won a career title so it should be plain sailing. I'd like to see some more consistency in Roger's game for this match and a little bit more composure when closing out sets / important games. I figure he'd have to play a joke match for Zverev to get a set so I'll go for a 6-2 6-4 victory. P.S. This will be the last post on here until next week as I'm off to Halle. I'll be back blogging on Tuesday where I'll hopefully be doing a recap of the Quarters, Semi Finals and Final :D.
I will still be able to read and answer comments though so let's keep the discussion going. And I will be announcing the winners of my giveaway then too. Lol spot on assessment of the match… Fed was a bit slow and rusty but at least he got it done. Personally I find Tsonga quite entertaining and good to watch. Could you tell me why you dislike him? Anyways nice blog, probably the best Federer blog on the internet now. Keep up the good work. Thanks. Ah I don’t dislike Tsonga, what made you think that? But he’s probably in my top 10 favourite to watch. Lol I guess I read too much into your nickname for him. My bad! By the way, I’ve observed that Fed’s serve is more erratic and less of a weapon nowadays. He gets less free points and hits more double faults nowadays. Is it just me or do you think so too? Yeah he hasn’t had what I’d call a good serving day in a while. Not sure why, I guess the ultimate litmus test will be against a good returner – Murray, Djoker, even someone like Nalbandian or Hewitt would be interesting. I need a win here! Fed needs to win Halle. Nice start from Federer! Really good on the return today but too many UEs. But the King of Grass is here and I expect a title this week! The draw is opening and I think he’ll get title 77(almost like McEnroe put a curse on him from ruin him haha)! Please update us with goodies and hopefully you have a great time with our hero as the victor! Bon Voyage! By the way, Fed might have to beat all Germans to win the title! Do you like Rafa’s chances for final 10 in a row at Wimby and do you fancy Roger’s chances if he faces Rafa in Wimbledon QF/SF? Yeah wasn’t a bad start, not great though. Still looks like his mind is half on court, half off it. Not sure on Rafa, if he wins Wimledon I will probably stop watching tennis lol. I was able to catch only one game but sometimes you play decent but still lose very bad. In this case, Zverev lost 54-22 by points. Wow! I was overall happy with the match. First matches on grass after a long clay season are never easy and Stebe wasn’t a walkover opponent – he has game, returned well, and kept a strong attitude even when he was badly trailing. Yeah he played ok I guess. Stebe wasn’t too bad but should be breadsticking guys like that. 3-3 still good though. Good stuff from Fed. A solid match to kick start his grass court campaign. Reliable returning statistics, but I had hoped he’d serve at a little higher percentage, as that’s pretty much the determining factor in his bigger matches. Looking forward to a (significantly) opened up draw, and it’s been a while since he last won Halle (2008). Have fun in Germany, Jonathan, and I certainly hope you get to see the maestro back to his best. P.S Finally bothered to nab myself a gravatar. Classis finger wag 2.0. Yeah I thought his serve was out of sync, hope he can tighten it up. He Sid, isn’t Roger’s 911th win…….if all goes to plan……. the Wimby Final??? (No, don’t worry, I am not getting my hopes up, I am just daydreaming !!!). 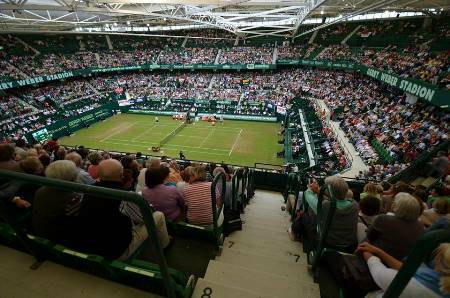 Have a great time in Halle – I have a question – please excuse my ignorance but is there a live stream for the matches in Halle? Hi Trudi, I watch via Google and then Streamhunter and it works for me. Maybe someone else watches it another way? Thanks, well TennisTV.com and Bet365.com have streams. You could try tose. The ones Katyani said will work too. Hi Jonathan, I thought I would be home in time for the match, but today of all days I had a traffic jam (right word? ), so I was just in time for the second set 5-2. But those two last games, what the hell?? Why does Roger want all the balls into the crowd, or he hits a hard shot and it is so hard that it goes out. He did it at 5-2 and the serving for the match, which was even worse. Almost got broken. He really like to give us heart attacks right? Ps: Don’t worry about him getting broke when he serves for the match. To be honest it does happen a lot to Rafa too. Saw it maybe four times this year (also at Rome). Jonathan, do you think that there is something wrong with Roger? He seems to enjoy all off court, but not when he is on court to play the match. Last year (and before that) he wanted to win, but he also enjoyed the match, the thrill of competing. I don’t know, it seems that he does not enjoy it that much. Maybe because of all the losing?? Someone needs to tell Roger that he has had too much fun. Time to take things a little more seriously. I hope he knows that Wimbledon is not too far away. There’s a title and 2000 points to defend. We don’t want him winning the Twitter and Facebook wars. We want an 8th Championship. So, pretty please, get serious. Hey Sid, you are right. As much as I love him, it is time for some tough love. There is basically no one “strong” left at Halle (they are already defeated or are all at the other 250 tour in London). So really, no excuses, he HAS to win Halle. Period. From now on there are slams and 1000 tours, making winning more difficult, so this one, Halle, he NEEDS to win it. Just lacking confidence / clutchness I guess. Not sure why. Hey Jonathan, sometimes I don’t know if I am using the right words, but about Roger, what he is unintentionally doing is proving the Great Uncle Toni’s point, about Rafa having more pain, about Roger not beeing the favourite and the worst of all about Roger not willing to do as much to win as Rafa. Last year he had three goals, this year he should make his goal to prove that “loser” wrong and to make him eat his words !!! I don’t understand why Roger is not seeing that as an extra motivation or as an extra fuel. What extra motivation? Roger’s 32. Nadal’s 27 and around his peak and with all the roid rage he exhibits, he doesn’t need motivation. As I said, Uncle Toni is the lowest of human beings, trying to antagonize a great player who isn’t exactly in his prime. The Nadal’s are very sadistic people. I guess it’s part of their territory. What I love is Roger never ever gets into a war of words with these creeps. Firstly, thank you for your great blog page, I look forward to your analysis and thoughts after every Fed match. I read them all but don’t comment . But I felt I had to today. I agree with your thoughts on Federer being rusty, and it may be partly from the surface change to grass. I have seen a pattern, and others have commented on it. The matches for this year, he starts quite sharply, looks good, moves well then the deeper he goes into the tournament it almost seems like he deflates. Since AO actually. His energy just seems to lower and he seems like he can’t get it back, can’t get his timing, can’t find that groove. To me, he does still seem to want to be out there, as he gets annoyed with himself, but it’s like something elusive that he fails to connect with and it frustrate him. While he loves the game , maybe the motivation is harder to get hold of for him as he has seen it and done it all, and he needs to figure out a path to get into it again.This would be something new he faces at this point in he career, so I keep telling myself , he needs time to navigate his way through this new territory. ?? It’s almost to a point where you expect to see it happen lately the further he goes into a tournament. I feel awful even saying that, but it must be very frustrating for him. I hope he can get it all to flow in Halle. Have a great time in Halle and here’s also to hoping you will be blogging about the final where Federer will win this and go into Wimby with that winning feeling! I kind of agree with you, this does look to be the case lately, no mojo. I think we just have to judge come the end of the season though. The way I see it, he either puts something together or he doesn’t, no real middle ground. Just gotta wait and see. Interesting perspective Amber. There does seem to be something not quite right in Fed’s game and it’s difficult to put your finger on it. His 2012 and 2013 are worryingly like chalk and cheese, other than AO and French, he was pretty much winning everything around this time last year! I don’t know what others think but approaching 32 and being father to 2 little girls must play some part in affecting his energy levels (I would know, I also have 2 and have aged about 20 years in last 5 years). As you say, hoping for an important win here in Halle to boost some well needed confidence for SW19. Goes to show how important these warm-up tournaments are, as judging by the stebe match it looks like Fed has some ring rust he needs to shake off in the next few rounds. Getting to the Halle final didn’t do him any harm last year, let’s hope for something similar this time! Think u 2 are right! It is as though his energy flags but I have said it before, with age, the fear of losing and of time running out looms larger and larger, and nerves play a real part. However, sometimes it strikes me that Fed is surprised to see the ball coming back again from some of his oppo. As though he feels he has done enough to win the point and he is not quite ready for another ball coming back at him, hence the timing is then off and he is late to the ball. He is not happy in long drawn out rallies, never his strength, has never been a grinder or hacker, but of late he cannot think his way out of it, plays a terrible approach and then gets passed! Part of the problem is that he has very entrenched patterns of play and modern retrievers can work it out pretty easily. So if his serve or FH are off, he becomes pretty vulnerable as he cannot sustain these Murray type endless rallies relying on the oppo to miss. All these guys are trained to endlessly return, hugely consistently, and he can be very thrown by this. Have to pay but tennis tv do it! Didn’t get to see the match but from reading your report, doesn’t sound as good as we would have hoped. It’s just so hard to know with him these days, you can’t really predict which Federer is going to turn up, which is very frustrating!! Hopefully he will get into better form as he spends more time on the surface. I don’t know why, but I have a bad feeling for Wimbledon, I don’t think he has much chance of defending just because of the form of the other members of the ‘big 4’. Rafa’s in great form, Djokovic is obviously still playing well and even though Murray is coming back from injury I think he’ll probably be just fine for Wimbledon. I think that injury lay-off will only have done him some good and he’ll obviously be very motivated to do well at Wimbledon. I really do hope I’m wrong though!! You didn’t miss much really. I’m not sure on Wimbledon either, not sure he is winning it this time around. US Open is my hope. Glad that Grass is finally here! With the draw opening up, Jerzy & Milos losing, Yayyy! I think that Haas would be the easiest SF compared to Monfils or Gulbis, they both have big serves & are riding high on confidence, & with 2 fast sets on grass, & Roger’s Nerves acting up lately, he could lose if he goes down early, like in Tsonga’s match @ RG. Katyani, I like your passion about Roger, but I’ll be happier if he wins Wimbledon or US Open, he needs more slams. Roger has 6 WTF titles, Knee-dull 0, but sadly those titles with 1,500 points and against the Elite 8 are ever discussed. Knee-dull gets more credit for winning 24 Masters (20 on Clay), than RF does for winning 6 WTFs and 21 Masters 1000s. For the YE No. 1, The Race to London is all that matters, defending points or not, you still have to win this year to get points. Knee-dull has 7,000 points right now, Djoker has 5,030, and roger just has 2,220 points. It’s likely that with the slow grass, a bit faster hard courts than IW or Miami, and not-so-fast indoor season, Djoker would out-perform Knee-dull by 2,000 points until the end of season, so Djoker would have 12,030 for example to Knee-dull’s 12,000 points. But for Roger to gain another 10,000 points before Year End, he has to win Wimby, US Open (4,000) points, WTF (1,500) points, and at least all remaining 4 masters 1000s, plus Basel. Impossible, even for the GOAT. But if he has a good 2nd half in 2013 & a great 2014, he might be No. 1 after US Open in 2014. Last year Roger collected 5,300 points after Wimbledon, so I hope this year he collects 7,000, winning both Wimby & US Open, and WTF, and throw a masters 1000s in there, & he finishes 3rd at YE, realistic but still very difficult. That is why it is likely that Roger finishes 4th or even 5th in year end, that would first time since 2002 that he is not in top 3 (2011 was only year he did not finish in top 2). Hi Mac, of course, just like you, I would love Roger to win Wimby and AO, but will he? Like someone already said here, he starts great, more than great, but the further he goes, the more problems he has (against others also). So for him to win the two remaining slams, yes please !!! But to be honest, I cannot see that happen. You know why? In slams Andy has to deal with Roger, Novak and Rafa. In slams Novak has to deal with Roger, Andy and Rafa. In slams Rafa has to deal with Roger, Novak and Andy. In slams Roger has to deal with Novak, Andy, Rafa, Berdych, Delpo, Tsonga, (Raonic and other big hitters like Isner) and some of the remaining top 10/20. You see, Roger has first already trouble with the guys that Rafa/Andy/Novak just go through like it is a practisematch. That is why, if Roger only wins one title this year, I am hoping for it to be the WTF. Yes, I had a bad year, but I won from the top 8 in the world, you cannot count me out or underestimate me and I will be back next year. But of course Mac, if he wins more after now, yes please !!! Hi Sid, yup, I bet Roger would trade one more RG for even 3 masters, specially if he beat knee-dull in the process! Katyani, I hope he wins Halle & gets the monkey off his back, it’s McRoids (aka McEnroe’s curse, 77th title), that jerk hates Roger and it shows, though he tries to hide it! Roger needs confidence and nothing will get him there faster than a title! I bet he regrets taking it easy on Haas last year @ Halle, I felt when watching the match last year that Roger was tanking it to help Haas recharge his career & it sure has, that victory put Haas on the path to get back to Top 10, which he will be there if he gets to Wimby QFs. Jonathan – Thanks for all the time invested in the blog, hope you’ll be witnessing & covering RF’s title celebrations at Halle. P.S. Hope my avatar shows up, guess who? I mean, it’s a no brainer that Roger’s in it only for the slams. He can’t be winning WTF’s and saying, “Look what I’ve won! I……………I’ve won the WTF!”, Tom Hank’s style. No we/he needs one more slam! Don’t care which but as I hv tickets for men’s finals, let it be Wimby! And even his first match showed me he still needs to change his racquet! Love him still but his lateral movement is more and more compromised! Was the back more I hurled than we thought? Clearly his serve is less of a weapon! Aces used to flash past…..
Yeah I pick slams over WTF any day. I don’t think Roger is regaining the number 1 again though, very unlikely between now and the end of his career. He’s play some insane matches as USO really. Classic! Never seen anyone else close to that no UF error streak! How do you get a gravatar here without having to create a WordPress account? I doubt you can, Conal. I think it’s the way Jonathan’s blog is wired with WordPress. Enjoy your time in Halle, Jonathan. To me, Roger just doesn’t seem right. Whether it’s physical, mental or what, I don’t know. He just doesn’t seem himself. The match today wasn’t too exciting. He’s not striking the ball crisply. Hopefully, things are on the way up. Yeah I know what you mean no mojo lately. Just gotta give it till the end of the year. Sorry if I said something wrong, as my post is not here. Anyway, Allez Roger! thanks, I feel like a bit of a dufus now 🙂 , I was looking at times of posts not realizing I was still down a ways on the que. So now he made it and you are getting to be there for the finals!! This is exciting. Hope you can move closer to the front. Have a good feeling with him against Youzney! Allez, Allez Roger! Wasn’t a GOAT performance for sure but a win is in his pocket so I’m satisfied. Though I would be extremely disappointed if he didn’t win the tournament. Do you hear me, Roger? Have a great time in Halle, Jonathan. Hope JesusFed will turn up! Hopefully Roger doesn’t clown up again and lose early before you get to see him like at Rotterdam this year! Isn’t Captain Caveman a more apt nickname than Dull? Y’know, short and aggressive with his bat, wild squinty grimacey eyes, the constant moaning/grunting, arse scratching, just perfect. He Dave, I like the nickname you gave, but love Alysha’s nickname for Rafa “Dramadal”. Sums him up in one word. What the heck is this curse of J Mac everyone is talking about? Did I miss something? What was said? When? And why? I think Roger is missing a title to overcome or tie (don’t remember) the number of titles Mac has. I think that’s what’s going on. You know, I like when Mats Wilander and Boris Becker comment, especially Boris, because they are honest and don’t bash someone. They always give someone their due. Mac Enroe on the other hand, I have not seen him play (was before my time), but even I can see he is jealous of Roger. Tries to hide it or talk over it, but he is. He did praise Roger when he won Wimby, but as soon as he lost Olympic, he was back to saying not so nice things about Roger. You’re right, Simon. I just looked up. John McAnnoying has 77 ATP titles. Ok, now I really want Roger to win Halle. I don’t care what it takes to do it. Does anyone know why Nadal isn’t taking part in Halle? Because his lawn mower was confiscated at the airport. He got mad and flew back to Mallorca. Nah it’s typical Nadal, he doesn’t want to lose in the second round no? So you’re telling me this guy will get no warm up on grass whatsoever, then just show up at Wimbledon? Well, only one of the following is true: this guy is the bees knees, or it only shows that Wimbledon doesn’t really have a different surface. He guys, have to comment about this. Igor Sijsling lost to Tsonga today, but man did he gave Tsonga trouble or what. He could have won, next time. Igor played really great. Andy also looks to be doing well. Again with wearing blue and yellow. Don’t they tell him to experiment with other colors than black, blue and yellow, especially yellow? I saw this match, Sijsling played well he has a big game, if he can string it together then he could give anyone a game on his day. Hi Jonathan, I saw the Queen’s SF it was I think between Andy and Tsonga. And….. it must be really frustrated sometimes to be Roger Rasheed. Beeing the coach of two excellent French players (first Monfils and now Tsonga) and not knowing how to get them winning slams. Especially Tsonga. He is or he can be so good that he could win slams, but when it matters he just wants to be popular and entertain the crowd. He could have won the match and he was playing very good and then suddenly he acts more like an entertainer. I never liked the fact that you guys called Monfils and Tsonga clowns…..but now I know why you do that. They don’t want to be serious enough to win slams, I mean they do, but they want more to be liked by the crowd, to be popular, to entertain them and give them something special. Now I know why the clown tag…. Can I just make this comment? Why is everyone (even the tennisworld and the tennis powers to be) expecting Rafa to win more GS because he is 27 and is 5 years younger than Roger? I did not see Agassi and Sampras play or the people before them, but I do know something about them from watching Youtube and reading the articles. Aren’t they great players, legends, who played so much and won so much, but till a certain age? Agassi and Sampras they were both doing not so well after a certain age, 27 or 28 maybe? The greatest player of all time, Roger, kept losing from the age of 27 or 28. That is the same age Rafa is now. When Roger was his age, other players figured him out and his game, started working on how to beat him, convinced themselves that they could defeat him and it paid off. He was not so scary anymore and not so dominant anymore and started to lose to guys he normally does not lose to. Why are they so sure that that will not happen to Rafa? If ALL the greats from history get to a certain age where they start losing, why is everybody so sure that Rafa will not undergo the same? other players are figuring him out and his game, they are starting to work on how to beat him, they are not scared of him and are even convinced that they can beat Rafa. Maybe they are not defeating him right now, but they are getting pretty close. He has never had this much problem (I think) on clay then this year. I think more players believe they can beat Rafa and eventually it will pay off (just like it did with Roger). Honestly the more I think about it, I can see him win two more RG but that’s it. And not even next year. Next year RG will be Novak’s. No way he is going to let that slip for a third or fourth time. I mean lets face it, he is 27. That is not that old but not that you anymore. He too is competing with guys who are 5 to 6 years younger than he is. And he does not have the body of a 19 year old anymore. His body is also 27 or even older. Novak is just the beggining. Pretty soon, most of the guys will figure out Nadal’s game. At 31 Roger is still winning not because of brute strength, it is variety. Maybe some of the top dogs know the Federer playbook but he’s always a puzzle in the court and because he has a variety of shots You don’t know what to expect compared to Nadal who has 3 basic weapons: Forehand with a ridiculous topspin, Psyching out opponents e.g. taking a lot of time to serve; Making the other player wait for too long before the coin toss and of course.. the disturbing “ehhhhh!” grunts with every shot that he makes. The closest one responsible for Nadal’s vulnerability and everyone knows this– Robin Soderling. How about taking a dose of your own medicine? Don’t be too sure. Once he felt he was losing his game, he went into hiding, bought much more powerful and spinny strings, took a good long rest and was back to moon balling. Look what happened 🙂 Oh, and I forgot, with Fuentes gone, maybe another version of the magic potion. I have often seen people critisizing Rogers one handed backhand which cannot handle Rafa’s topspin forehands but we can also say that players with one handed backhands more often win Wimbledon as courts are fast and stay low. It is just that Rafa is the best clay court player ever with Roger the second best clay court player and best player ever. Hi Katyani, Agassi actually won 3 Aussie Opens at 29 and 9 months, 30, and 32 and 9 months, and he is the oldest person to rank No. 1 at 33 years and 4 months old, you can look up his profile on ATP site, and many others, like Sampras. Agassi retired at 37 and still was in top 20 at 36 years old, however he was not consistent like roger, he dropped out of top 10 around 27 and got back to No. 1 at almost 30 years old. However, Agassi was not lucky, as Sampras would usually get back to No. 1 again by year end, back & Forth, that is why Samoras finished No. 1, 6 years in a row, though he was not always ranked No. 1. Ken Rosewall is the most amazing, he had a fluid game like roger and played until he was 43 years old and he was ranked N0. 2 at 39 years old, there is not much historical data before Open Era 1973. But Rosewall won Aussie Open at age 39, and at age 40, he went to the finals of both Wimby & US Open. You can catch some highlights on You Tube! Now you think that I’m 70 something, haha, nah, I am just a student of the game, much like Roger, to validate for myself that Roger is the GOAT, I had to look at the history if the game. Here is a short clip on the greats voting Roger as the GOAT in 2010! Katyani, As for why commentators say that Knee-dull might break Roger’s slam record, it is just propaganda, most of these guy hate Roger for his accomplishments, they are jealous like McRoids (McEnroe)! However Knee-dull is a coward and as we have seen before, he will cheat to get the records. if he continues to take time off year round and just play the Clay season with a few hard courts thrown in there, he could last until he is 34 years old. And he will win at least 2 more RG before he is totally washed out, 32 years old, so his total would be 14 and maybe more just from 10 or 11 RG wins. He has won just 4 non-clay slams from 19 to 26, could Dopal win another 3 non-clay slams in the next 5 years, hopefully not, as Djoker & Mugray are strong on Hard courts & grass, but it is likely. That is why Roger should win more slams to widen the gap, hopefully 20 slams before he is done. Also, Roger has had to adjust his game over the years as the courts have gotten slower & slower. You can see in his match against Sampras from Golden days of Wimby, 2001, that he was a Serve & Volley Specialist, but then Grass started to get slower & slower, see the link below for highlights. http://news.bbc.co.uk/sport2/hi/tennis/4121364.stm , Henman in 2005 complains of slow grass! Federer had made 18 of 19 slams finals until 2010 Aussie Open and won it at 28 years and 5 months old, and of course he nearly won RG 2011 and then Wimby in 2012 at nearly 31 years old. I think Roger would still be rocking if it was not for the homogenization of the courts, which is all a greedy effort for more $$$, longer matches produce more revenue for ATP & ITF. Hi Mac, thank you for your comments !!! Somehow I missed them and just read them. Loved the clip of the other players talking about Roger beeing the Goat. Did have to count to ten when I saw Rafa and especially Mac Enroe. Do not like that guy at all. I think he is a player who is jealous of Roger. Talks great about him, until he loses, then gets back to praising Rafa and others. Speaking about Mac Enroe, what does “Mc Roids” stand for??? Why the name?? Oh one last comment, you know, fans are not stupid. If Rafa loses one of the tours badly like last year Wimby and went away for a few months and came back to win 100 clay titles…. I think the tennisworld or even his own fans will explain it to themselves that he did it because of the knee problem. But if he does it maybe for the third time, I think even his OWN fans would desert him by saying, what the hell are you doing and why are you going into hiding? He can pull off another Oh my knees for a second time, but not for a third time. His fans and the rest are going to see through that soon. And the way and how much he played this year, do you really think he will have energy left to go for the rest of the five months?? This should teach me to write comments between twelve and one o’clock at night. Murray wears the ugliest clothes in tennis. Apparently he is also the biggest slob in the locker room. But his facial expressions on court are very entertaining. I think Roger is continuing to have back issues on and off. Some matches he plays like his old self and others, particularly when the tournament progresses, he is way off. His movement and foot work aren’t good which in turn creates all those UE. I think Hasse has a great chance to win this again if Roger’s game doesn’t improve. Hope for the best though. I agree. Was at Queens today, his outfit is awful, but his tnis is pretty good, hv to admit! Roger was awesomely sharp today but Zverer was just terrible. Real tourney starts tomorrow v Haas! Roger to win in 2 tight sets! Murray to beat Tsonga, and to beat Hewitt ( who rolled back the yrs v Delpo today, boy does he look uncomfortable on grass!) who will beat Cilic! Haha Susie cutting to the chase. Murray probably just not a priority for Addidas really, expect him to get some new threads if he wins Wimbledon. Roger just won his match, he gave the other guy two bagels in just 40 minutes !!! Go Roger Go. Keep this up !!! Ah Shite, katyani beat me to it! Didn’t watch this one live but watched it at the apartment I stayed at, decent match although Zverev was predictable in his play, guess Fed knew what to expect even though they haven’t played a whole lot. I am at work smiling from ear to ear. Hope he remembers now that he is still good and that he continues this this weekend ………….. and of course after that. By the way, Ru-an wrote a very interesting article about Roger and Rafa and Doping. You should all read it. I don’t usually read articles on other web sites but I did. There really wasn’t much information in it. Ruan was simply praising Nadal all the time 🙂 I find that “doping” statement by Nadal very suspicious. Lance Armstrong denied till the very end that he did not dope. Anyways, hope Roger was simply playing possum all this time and has a great second half. What Roger needs is a slam or two to seal the deal. 3 GS, if he could get to 20 (which is possible in lets say 3 years time), then it would take another whole generation to surpass him I think. Yes , it’s a dream, but hey…. a girl can dream right? Oh hope so….. he would deserve it so much… but one match at the time, one point at the time. It sounds like he flip flops, convinced one moment that Nadal is clean, he’ll pass Roger’s record, to thinking that he is not clean Roger’s record is safe and then back again. And that quote from Nadal, he is either truly naive or he is protecting something. I believe Murray also said something similar on how he believes Tennis is also clean. Roger says it’s naive to think tennis is clean, and I believe him. Imagine driving on a road that has a speed limit of 45 mph. The rules are in place except they aren’t enforced. You really think nobody will speed? There’s a lot of doping going on. Folks, the testing process is a joke. It is virtually non-existent. And there are no consequences to skipping scheduled tests. It’s the perfect recipe. These are professional athletes we are talking about who make millions, some of them, tens of millions. Are you flippin’ kidding me? If they know they won’t be tracked, or caught, they will resort to PED’s. Anyone who thinks otherwise is the biggest idiot in this world. I thought it was a good article. I think Ru-an thinks instinctively Nadal is doping but since there is no definitive proof he has to give it both ways. Sometimes I am convinced, others I just don’t know. I agree with Sid though, the testing is a joke and when so much $$$ on the line it makes sense as doping is only a calulcated risk. Players don’t want to forego income if they can get added assistance with little to no real risk. 39 minutes!! That’s like one standard Nadal service game! Happy for Roger, but in the match itself, his return was the only thing that NEEDED to click. Zverev played old fashioned serve and volley tennis for large chunks of the match, and that spells death in the modern physically grinding world with racket technology the way it is now. By the way, 39 minutes is like the extra time Nadal and Djokovic take combined in a five setter. Thanks man, it’s all in the comedic timing. Haas is through to the semis now, and we get a repeat of last year’s final. I’m thinking good things here. Last time Fed won 6-0 6-0, he went on to lose to Nalbandian from two sets up in the next match. Assuming Haas plays for this to repeat, it’ll be too late by the time he realizes Fed’s two sets up and so has won already. Love the comment on sweet spots! Haha peRFect Tennis – the home of all tennis related banter. Someone tell me what the f*ck monfils is doing?…. Never mind Monfils, Hewitt is burnin’, baby! He should be Gonefils soon, if Haas doesn’t mess up now. That shot Clownfils plazed was too funny though. Who does that in a competitive match? Cracks me up. Jonathan, at the beginning of this year you said that this would not be Delpo’s year. Looks like you will be right…. Delpo peaked in sep 2009, will never win another slam, you heard it here! Not nearly tough enough! Hey Susie and Sid, you know, I really like Delpo. What you see is what you get. He does not act or overact and I love his innocence. But……one thing that irretates the hell out of me and I can’t get passed it is the way he moves and acts on court like an old man !!! When he plays or in rallies he is super fast. But between points he acts like he is 70 years old. Grasping for air, walking slowly from one side to another and taking forever to play. I saw him play live in Rotterdam at the SF with Dimitrov. There he did the same thing. When I see him on tv, I always want to offer him a chair to sit on between points !!! I think he is too injury prone. He definitely has the talent, you don’t beat Fedal in a slam without it. Just lacks the fitness. Like Roger once said, he knew he had it in the arms, it was just a matter of whether he had it in the legs. Same story for Del Potro. I had hope after Indian Wells but Del Potro is cursed. People forget that he is only 24 so he still has some time to rack in another slam. I don’t think it will be any time soon though. Credit to Hewitt might I add, the guy still has quite a game on grass. Del Po lacks fitness, naturally brittle too I think. I think he can win another slam but he would need to be able to handle 7 matches again. Looks like Roger left the oven on last night and served up some baked goods! Haas is playing so well this year, unbelievable really. Think this one might go to three? Cheers Alysha, just sat waiting for my flight back now. It was a really fun weekend, didn’t manage to bump into Fed, although I did stand next to his street sign and seeing him play twice + win the final was definite payback for Rotterdam! I think if Roger can get passed Haasi in two tight or three sets, he will have less problem against Gasquet (who will defeat Youzhny). So hope Roger wins. He has to win. Haasi is playing some incredible tennis. Way to go from the thirty somethings (Hewitt also), showing the kids how to do it. Hey ! Think Roger heard me and served up 15 aces! About time! Good win today. Think he will play Youzhney, Sasquatch looks so uncomfortable today on the grass! Yep, love Delpo but he is kind of slow and shambly on th court! Awful day at Queens. Enjoy the final in Halle in the sun J! Hey Jonathan, if you talk in Halle to the big guy (not the one in the heaven), can you mention me, his biggest and most passionate fan? Can you also mention that as much as I love his haircut, it is time to get his curly hair back. Now I do miss his curls !!! 1 set all. Come on Roger please dont flunck this match against Haas!! Yes Rogers in the final…. 1 more to go!!! Yes……. 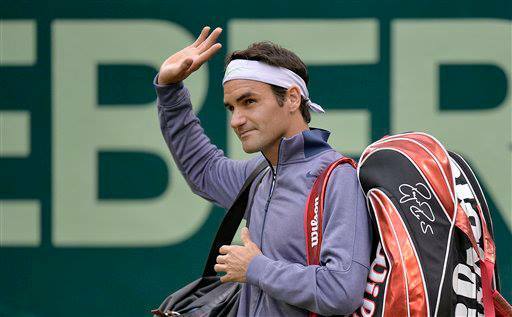 Go Roger Go…… into the final. One more match to go. This one was a tricky one. Hopefully he will win the final in two tight straight sets or just like today in three. I loved that he went up an extra gear in the second set. – I thought Roger moved very good. It that true or could he have moved better? he rarely plays aces or a lot aces in the next match. Is that true or am I worried for nothing? Oh also about the match, I thought Roger defended very well. He was right there at the net, kept closing his side and stayed there. Liked the fact that he took risks at the important points. He also went after every ball Haasi played. I thought he played really well today. Double figures on aces in final too! Good omen for Wimbledon!!!! Really needs free points there! Haas match was fun, Roger wasn’t playing great but he did enough and captialised with Haas firing down double faults for fun. May have been different had Haas served better but Roger definitely wanted to win and cranked up his first serve speed when he needed to. No gifts for his old friend Haas this year. The last time I watched Youzhny play was I don’t know when. He can play some shots on grass! Hope he keeps a cool head and gets it done. I believe!!!!!!! ( hopefully). Queens not happening today! Looks like a Monday finish again! Wacky weather everywhere, including the US Open Golf! Yes, although gave th fans value for money in 3! Turned out to be another Spot-on-Susie prediction and 3 sets. Definitely value for money! Hi Guys, a H2H doesn’t say or mean anything. Roger has a 14-0 H2H with Youzhny, but you never know. At the final they all begin from square one. Maybe Roger will win, maybe Youzhny will win. You don’t know what will happen and who will have a superb day (remember Rafa/Rosol?). Roger has a very good record against Youzhny, but he should not UNDERESTIMATE him. Youzhny beat some dangerous players to get to the final (Nishikori, Kohlschreiber, Gasquet). He deserves his place in the final and he deserves to be respected for that. Even by Roger. It is NOT a given that Roger will win. He needs to play Youzhny with his heart and brain and not make the mistake of thinking that this will be a walk in the park. Go Roger Go. Don’t underestimate Youzhny, he is playing extremely well. I was actually extremely happy that Roger had to come a set down to win it. Just shows that Roger 3.0 is still in there ready to climb back. Also loved seeing some fist pumps and cmons/allez shoutings here and there. This title is critical for Wimbledon so a loss to someone he’s beaten 14 for 14 isn’t going to go down to well. Youzhny plays well on grass but I expect nothing other than the masterclass Roger put on against him last yr at Wimbledon on his way to winning the title. This is where the season counts, first title of 2013 here we come, Allez Maestro! Agreed. Losing to someone like Youzhny would mean end of the road, literally. No disrespect to Mikhail, but I’m sorry, a loss here, I know it won’t happen, would mean curtains. True, Youzhny was the form guy this week but Roger needs to be beating guys like that all day long so I’m glad he did just that. First set was a weird one, had plenty chances but just wasn’t quite finding his game in the breaker which handed it to Youzhny. Turned out to be a good thing as winning a title from a set down is a nice thing to do. No blips serve it out too and you could tell he wanted to be on court which was good to see. Twins loved it too when they came out for the trophy presentation. Too funny. Anyone else thinks Youzhny is playing way too good?? Roger is grunting again between some points. Not a good sign. Come on Roger…. This set should have ended in the first game. Never lasts! Cannot close out, and voila! Good win just before Wimbledon! Note to self: If Roger loses today, I’ll ban myself from watching tennis for the year. Phew, thank goodness Roger won! What Wld we hv done without you!!!!! Federror turned up today. Missing those break points in the first game cost him big time. Does anyone else think Jonathan travelling to where Fed is playing is some sort of a curse lol? First Rotterdam now Halle. I’m going to be sick now. That last game, Youzhny gifted away three points and still held. We will know soon if Jonathan really is spooking Roger. All panicking after the first set huh 🙂 I was as cool as a cucumber in the stadium watching, first set was an anamoly, Youzhny was playing well and Fed just not winning the crucial points. All changed after that though and Fed tightened up his game. Never in doubt. I think Roger is playing well, just not winning that “one” point. But he will win one of those soon. And, as if on cue, he gets the break 🙂 Game, set, and match you think? Sums up the match I think. First set was close but just lacked that one point when he needed it. Poor returning from Roger today. If this is what it feels like in a 250 tournament, count me a bit worried for Wimbledon where I have a sneaky suspicion a one certain Rafael Nadal will be waiting in the QF. I doubt they will meet in the QF. No sooner than the SF. I wouldn’t worry just yet Alysha. I don’t think he defends Wimbledon but this tournament has surely put him in a better place mentally so you can’t rule him out. Youzhny has quite a big serve too, flies through the court. All team Fed seemed to be very happy and in very good spirits and I think that was reflected by Roger’s performance on court. I can feel Youzhny is going through a low. How low, and how long? I do not know! You know guys, this is good for Roger. He did underestimate Youzhny and is now paying for it. But….. he is also fighting and he wants to win and will win. This is also good, even if it is a 250 tour and even if it is on grass, he has to work for his win, for his first title of the year. You cannot always have it easy. NOW…WHEN Roger wins, he will know he earned it and that he still has a fight left in him. This should’ve been done and dusted in straights. But Squanderer showed up. Who knew! “Yes, Federror turned up, Squanderer turned up”. What do you guys want? If he lost you would make an unpleasant comment. If he won in straights you would say, well done, but it was too easy, don’t know where we stand on Wimby. If he wins after losing the first set, now you say, good he won, but he should have done it in straights !!! It really is not a win win situation with some of his fans !!! Just be glad you saw today the hunger to win, his fighting spirit, him fighting even though he was tired a bit and it did not go his way. Be glad he did not take this match too lightly after he clearly underestimated Youzhny. He got a grip on himself and he was back. He wanted and he needed this title. And to be honest, if Novak/Rafa/Andy were playing Youzhny like he played today, THEY TOO would have problems, yes they too would have won, but even for them it would not be easy. And no, I am not beeing his normally passionate fan or in your eyes a “blind worshipper”, but give the guy a break. I myself get sometimes mad at him and disappointed in him, but not today. Today I am extremely proud of him. So what if it was a 250 title. So what if it was on grass. So what if it was just Youzhny. Roger is getting older, getting more slower, wearing a black shirt at every match because of some backproblems. It is not like because it is Youzhny he should have bageled the guy. Can’t you be happy just for today? Today I am just happy that after 10 months he won a title. He might lose in the QF at Wimby or even before that !!! But…. he might even be outplayed sometimes at Wimby and still win because of the hunger to win and because he will fight for 8th Wimby. I am not stupid, I am not going to get my hopes up for a Wimby title to be disappointed again, but I will take it one match at the time. He might lose Wimby, but he might win it also. Stranger things have happened. As long as you believe that Roger wants it badly too and that he can do it. I for one am glad he got tested today (like yesterday) and that he overcame it. If you had not noticed, Youzhny played the match of his life !!! And just for you guys, this years hope for Wimby, Andy Murray just lost the first set to Cilic with 7-5, AFTER he was up 4-1 !!! 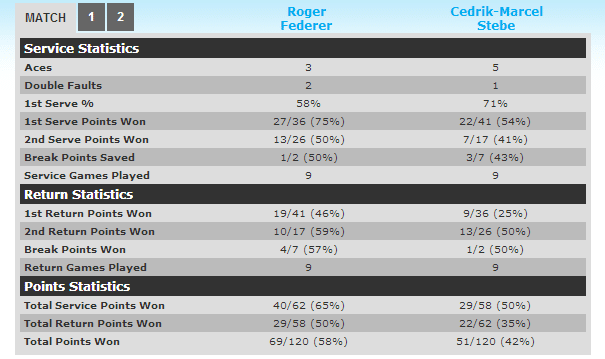 Even Roger did better in his first set, he lost by one point. And now….just like Roger….Andy has to go an extra gear up to win and he will. There was nothing wrong with my statement, “Squanderer showed up”. That’s exactly what happened. Nobody wastes as many break points as Roger Federer. If he had made three more of those, he would’ve been sitting on 20 slams today. A blind worshipper is never critical of their favorite player. A true fan criticizes at times. A vast majority of us will watch a vast majority of Roger’s matches sitting on the couch. In many ways, the comments we make here are nothing but a true manifestation of our thought process as we watch the game unfold. I knew despite Youzhny’s superb play in the first set that Roger had the game to pull it out. Roger did not underestimate Youzhny. You don’t underestimate someone breezed through their QF and SF in straights. This is a good win for Roger and should give him him a lot of confidence. Youzhny is no Djokovic, Murray, or Nadal, but given what Roger has gone through, this could well be the day that turns things around. No he didn’t. Not for parts of the second and third sets. Except, Cilic is ranked way higher than Youzhny and Cilic also happened to be the defending Aegon champion. after Jonathan, you are the second one who had to go through my “Roger Wrath” !!! So hope Roger will one day know what kind of an effect he has on me. I am writing harsh replies and getting into “non verbal fights” “defending” him, even with my collegues at work. They know Roger is my soft spot, so they use his decline and losses a lot to get a reaction out of me (which of course works !!!). So now that I am calm and read my reply to you again, I know that I meant it well, but I was too hard. So hope you did not mind my reaction too much. Will try (will be difficult) to write such replies less often. Anyway, I am waiting for Wimby to begin and my goal or hope for Roger is that he keeps his QF streak alive. The rest is a bonus. To Roger and beyond !!! Come together Fedfamily, something finally gone our way this year! Congratulations Roger you deserved it. Take this now and do great things for the rest of the season. This win and Haas must’ve upped his confidence quite a bit hey? Yeah happy days!!!!!! 🙂 the curse is finally broken. More than me and I was here for 4 days. Export English all the way. Do a pretty good Leyhani impression though, Spiel Federer! Couldn’t watch the match, since I’m revising for finals at uni, which begin tomorrow. Did Roger play well? Was the 1st set a tank? Roger played good considering that Youzhny couldn’t do anything wrong in the first set. A poor play at 5-5 in the breaker was enough. Roger could’ve put a mid court ball anywhere but didn’t and paid the price. Youzhny seemed to lack energy later in the match I felt. It may seem Roger made UFE’s but you’ve got to understand, Youzhny was taking it to Roger so errors will be made. Still, Roger did play some points very poorly. But, a win! Federer gewinnt seine estren titel des 2013! That’s all that matters. From what I saw, I think Roger is ready for Wimbledon. Oh…wishing you the best for your final! Hope they will be done soon so you can enjoy Wimby? Thanks Sid. I’m finished on Thursday, just 3 hours a day, so I will in fact be home to enjoy the whole of Wimbledon (bar qualifiers), and take a hopefully deserved break from mathematics. Can’t wait! Been too long since we cld all celebrate together with a Fed win! So plsed you were there!!! Anyone remember this from Youzhny? (LOL) Worth a look if you’ve not seen it. http://www.youtube.com/watch?v=wrgKTYIvWCo How does the chair take that hammering and still remain in 1 piece? Almost as crazy as where he hits himself repeatedly over the head and draws blood! Oh yes, that was gross man! This guy is one tennis ball short of a full can 🙂 But I like Youzhny. b) it happened so fast, c) I have to look at it one more time when it is uploaded on Youtube. Today Andy won the Aegon Tour. Good for him, just like Roger he had to work for it. After the match there was an exhibition match between Andy, Tim Henman, Berdych, Lendl and other celebreties. It was for a good cause, for Andy’s best friend who unfortunately was diagonosed with cancer, which he is fortunately overcoming. Andy was really amazing for organising this. He also donated today’s final winnings to the cause. I was so proud of him, even applauded for him from my couch. The exho was really funny, especially Lendl. Never knew he was that funny, really a comedian. I was so impressed with him. Anyway, first set was Henman and Andy vs Berdych and Lendl. Andy and Henman won. Second set, 2-2. Henman and Andy were miked up. Andy was playing with Jimmy Carr (?) a comedian, who was wearing a Roger shirt from Wimby. His name was not on it, but even I could see it was something Roger wears at Wimby. So get this: Andy looks at Jimmy and says: why are you wearing a Federer shirt? Jimmy says: because Federer is an excellent player. Andy looks at him, knowing or forgetting that he was miked up and says to him: no he is not, not anymore !!! I thought that was such a cheap shot. Lost completely respect for him right there. He just won his third tour of the year, why involve Roger in it? Even if it is true or he believes that, why the hell say it on national tv? Doesn’t he know that it will come out and Roger and everyone else will know it too? Roger is not perfect and he may talk about other players as well (in private), but why say it out loud? Doesn’t he know we live in a social media time and world? Maybe a long story to say something so short, but I wanted you guys to know how it went. And it is not like he said something totally wrong or unbelievable (it is right), but why say it in such a manner?? I will find it on Youtube if it is there and let you know how it really happened. This is how they talk about Roger…. the greatest of all time….the one which made them play better because they all wanted to beat him…. the one Andy (in my opinion) “owes” a tini tiny bit to, because if Roger was not tired, he WOULD have won Olympic Gold. Lol, nothing to see here. Mugray has never liked Roger and it’s no secret that the only player he loves is Dramadal. Though saying that on national TV is distasteful. I’ve never liked him anyways so this isn’t surprising. Maybe he was taking a dig at Roger, you know sometimes you just roast someone you know well? And the other guy was a comedian? So it might all be comical after all. Can someone please send me a link or something? What do I search for in YouTube? Besides, it’s about time that all this respect we see between these players is nothing but a facade. For example, Nike is an important reason Nadal and Co are kept on a leash or they would’ve unloaded on Roger by now. Probably? No, it’s true 🙂 Nothing is more detrimental to a brand than two of its ambassadors throwing low blows at each other. Not Roger though, he would never do that. If he did say it. Trust me Vandana…. Andy does not want to meet me in person to give him a piece of advice….. after the way he spoke about My Roger……. it would be best for him to stay away from me !!! No, seriously, I know that some say he made a comment about Roger not beeing world number one, but I was listening and although it was not clear, he did say it about Roger not beeing an excellent player anymore. I could not find a clip on Youtube. But it is not bad at all that he said it, really, like I already wrote, it is not as if Andy said something that was not true or unbelievable. I just thought that it was very stupid of him to say it on national tv. Knowing everybody has mobiles, mike picks up anything, social media. I know he meant it and that does not matter, but why say it outloud?? Disrespectful curly goof. I have never once taken to that fella, and as a Brit myself, I have supported the British players since the early 80’s, even the no hopers Jeremy Bates, Andrew Castles, Petchley etc I used to sit through their matches, willing them on. This guy arrived on the scene kitted out in his Scottish armbands -only English players up to this point had ever been good enough to get to televised stages and fly the flag for Britain, and now that a Scottish guy could finally join this club, and immediately his image was wanting to shake off the rest of Britain and represent Scotland only. More fool the fantastic England and Welsh fans who would travel the length of the country, pitch tents in queues overnight at Wimbledon to support and cheer their British player, only for him to deny he is content to represent the whole of Britain. Only when it suits him I guess. He even lives in England and has a English girlfriend, so I don’t know what his problem is. He once said during an interview, that when it comes to England national football team, he supports “whoever England is playing” and later tried to brush it off as a joke. A bit like he will yesterday’s Federer comment no doubt. I so hope they meet at SW19 now and that Fed can ram that so called joke down his throat. Remember people, Federer is pure class, athlete and as a person. Murray will never be a Federer in a million years. Have to say, I don’t remember hearing that, Katyani. Mind you, the miking was a bit erratic. Hadn’t seen this so I will comment when I have watched it. I doubt Murray would say it seriously though even if he does think it, would have been a right gaff to forget you are on microphone. Likely said in gest, especially seen as though the guy wearing it was Jimmy Carr. I actually think Murray is pretty respectful of all great champions! He was quite outstanding in his genuine support of his close friend and is clearly a loyal guy. He and Fed hv always got on ok. Wld doubt he said it and Jimmy Carr! Wldnt trust him as far as I cld throw him! Horrible man! Hi Susie, I really admired Andy for doing the exho to raise money for the cause. He even donated his pricemoney. And don’t get me wrong, I loved the exho. Never ever knew Lendl was that funny. Andy had two shots that were just too good to describe. I knew some of the celebreties, not all of them, I really enjoyed it and it was fun. I loved the part most where Andy’s friend (forgot his name) said that he would try to comeback to play at AO doubles next year. And even if Andy said that about Roger, it is his right, I do think it is stupid to say it out loud. It is not like Roger is losing everytime to Andy. He did beat him at WTF SF. So he might beat him again…. Hey guys, I found something which should hopefully put this to rest. As Homeboy_Hotel there pointed out, someone said “Federer is world number 1” and Murray said “Not anymore he’s not”. Afterwards, Murray and Henman will face each other across the net, playing alongside a series of doubles partners that is billed to feature the Mayor of London, Boris Johnson, TV stars Michael McIntyre and Jonathan Ross, Sir Richard Branson and actor Eddie Redmayne of Les Miserables fame. I thought you were in Germany Jonathan!!? And it was funny! Michael Macintyre hilarious! Thanks for keeping the discussion going whilst I’ve been away. I’ve been reading comments but didn’t take my laptop as I wanted to get away from it for a few days. Currently sat in the airport with some time to kill trying to type on a bacteria ridden public German keyboard where the Z & Y are in different places to what I’m used to. Halle was really fun, I got a few ok-ish pics of the GOAT, cheap camera so nothing spectacular but if they look good I’ll put them up here in my Halle review post which I will be doing tomorrow at some point. Final was a good level really too I thought, don’t know how apparent it was from TV coverage but Fed was pretty fired up in the second and third sets which was really good to see. He wasn’t at top top level but I thought the key areas of his game worked when he needed them too and Youzhny was the form guy this week so beating him is definitely a good boost pre Wimbledon. Agree! Fed really wanted this! Live coverage on tennis tv pretty gd! We await yr blog!!!!! Will you post the link for crying out loud? I couldn’t find anything. Apparently “pick-em-up truck” is a recognized Southern US regionalism. Whether it’s genuine or one of those apocryphal over-the-top hayseed hickisms, I have no idea. I had never heard it before. In any case, this one is a classic – I now start giggling just seeing the still posted somewhere. Oke Jonathan enough is enough….. It is twelve o’clock in Holland. I am tired, have to get up at five and I am really tired waiting for your new article so that I maybe have a chance of first comment…. Between Roger and you, don’t know which one of you will make me crazy first or give me a heart attack or get me fired at my job for beeing tired without any reason !!! Good night and tomorrow I will see what number commentator I am….